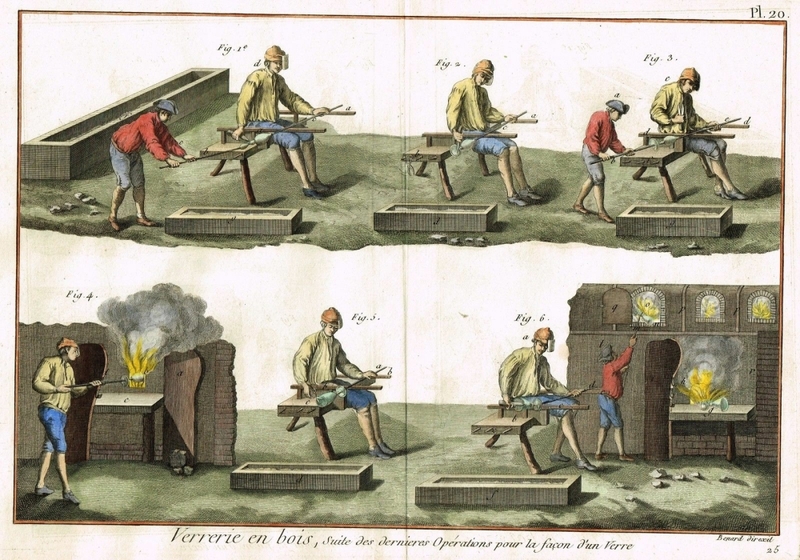 The museum recently purchased four original prints from the Encyclopédie by Diderot and Jean Le Rond d’Alembert, published in Paris, France in the 1760s. What is remarkable is that these prints show that the techniques used in today's handmade studio glass are, essentially, little changed in 250 years. The Encyclopédie, ou dictionnaire raisonné des sciences, des arts et des métiers (Encyclopedia, or a Systematic Dictionary of the Sciences, Arts, and Crafts) included 17 volumes of articles, published between 1751 and 1765, and 11 volumes of illustrations, published between 1762 and 1772. The plates purchased for the museum library are from the latter set of volumes. 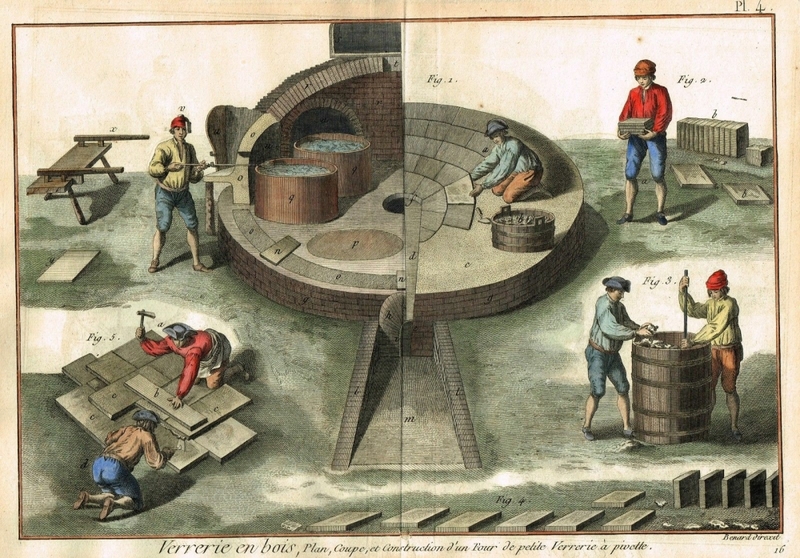 Plates relating to glass manufacture were published in seven sections: Manufacture des Glaces with 46 plates (38 folio and 8 double folio) on the manufacture of window and mirror glass, Verrerie en Bois, Verrerie en Bouteilles and Verrerie Angloise, which together have 54 plates on small scale glass manufacturing, including domestic wares, Miroitier Metteur au Teint with 8 plates on the manufacture of mirrors, Lunettier with 4 plates on optical glass making, and Vitrier with 4 plates on the glazier's trade. The contents of each plate are described in detail on separate pages. 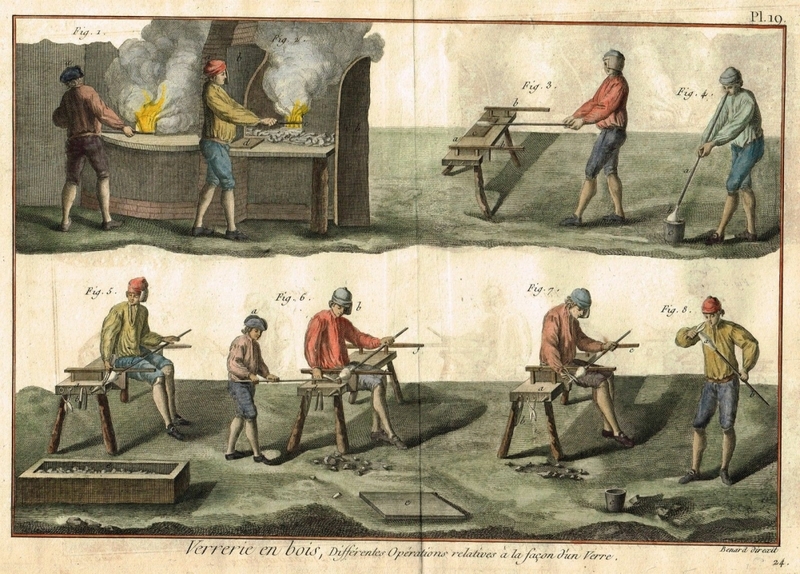 The four prints purchased for the library all come from the section entitled Verrerie en Bois. They were all engraved by Robert Bénard, who contributed at least 1,800 plates to the Encyclopédie, and later hand-coloured. 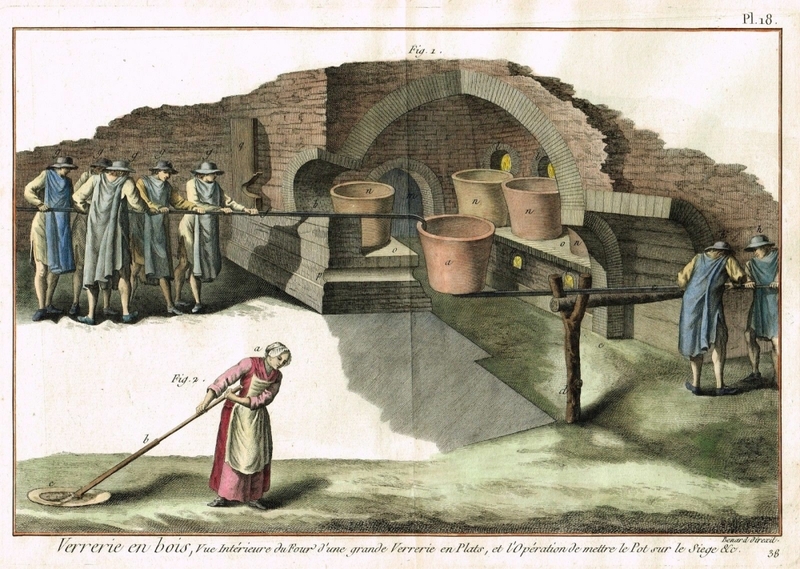 There was an article on the depictions of glassmaking in Diderot's Encyclopédie in Journal of Glass Studies (2009) Vol. 51 pp. 154–160, which is available via the website of the Corning Museum of Glass. Please click on the thumbnails to see a bigger image.